In remembrance of the 100th anniversary of “The Great War” or “World War I” and the woman behind the soldiers on the front lines, I will be posting several stories over the next few months highlighting some of the incredible woman that contributed to the war effort. 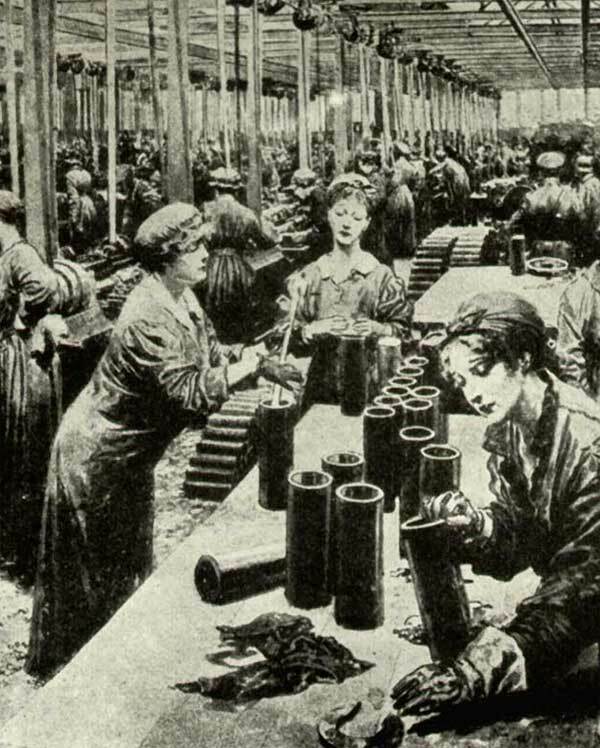 WWI was a pivotal time for women because it gave them an opportunity to prove themselves in a male-dominated society. With so many men going to war, there was a large gap in employment and in providing services that were traditionally provided by men. Women in WWI were mobilized in unprecedented numbers on all sides of the war and in all corners of the world. These women were drawn into volunteer services, drafted into the civilian work force to replace conscripted men and needed to work in industrial plants – including the greatly expanded munitions factories. In the UK, posters with persuasive images were designed to solicit female involvement in the war. As a result, many women left their domestic lives to join munitions work as they were enticed by what they thought were better living conditions, patriotic duty and high pay. However, these posters do not communicate the reality of the dangers that munitions work entailed. There was never any reference made to highly explosive chemicals or illnesses due to harsh work environments in the munitions factories. There were many ways that women participated in the war effort. Women were deemed ‘soldiers on the home front’, encouraged to use less of nearly everything, and to be frugal in order to save supplies for the war efforts. Not only did women help raise money; they rolled bandages, knitted socks, mitts, sweaters, and scarves for the men serving and sent letters and precious packages to their loved ones. However, one of women’s largest contributions to the war was in the form of voluntary organizations and they volunteered millions of hours of unpaid labor. In the UK, The Voluntary Aid Detachment (VAD) referred to a voluntary unit providing field nursing services, mainly in hospitals. The VAD system was founded in 1909 with the help of the Red Cross and Order of St. John. By the summer of 1914 there were over 2,500 Voluntary Aid Detachments in Britain. Of the 74,000 VAD members in 1914, two-thirds were women and girls. One of the biggest organizations in Canada was the Imperial Order of the Daughters of the Empire. By WWI the IODE was of the largest Canadians women’s voluntary associations. The IODE’s most important war work was putting all the time, money and effort that it could muster into caring for servicemen and their dependents – before the men left, after they departed, and after they returned from active service. One of the primary roles for Australian women during WWI was nursing. The Australian Army Nursing Service (AANS) comprised more than 3000 nurses during the war, over 2,200 of who served outside Australia. Nurses were present on the Western Front, and in Greece, England, India, Egypt, and Italy. Sister Pearl Corkhill was one of the few Australian Nursing sisters to receive the Military Medal. American women served in the First World War in a number of ways. The armed forces accepted women into non-combat roles, supporting troops as nurses, cooks and administrative assistants. 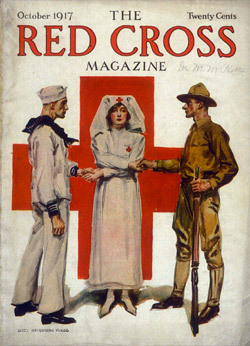 Organizations, such as YMCA, Red Cross, and the Salvation Army sent women to Europe to help the service men. Professional women such as doctors were few and had a tough time being taken seriously. Doctor Mary Crawford a female physician forged her own pass to service in WWI. In March 1917, the Secretary of the U.S. Navy realized that the Naval Reserve Act of 1916 used the word “yeoman” instead of “man” or “male”, and allowed for the induction of “all persons who may be capable of performing special useful service for coastal defense.” He began enlisting females as Yeoman (F), and in less than a month the Navy officially swore in the first female sailor in U.S. history, Loretta Perfectus Walsh. The contributions make by allied women to the war efforts during WWI, on the home front and on the front lines, are immeasurable. However, we cannot forget those women and families that were living through the war on European soil: on the western front in France and Belgium where much of the fighting took place; on the eastern front between the Russian Empire and Romania on one side and the Austro-Hungarian Empire, Bulgaria and Germany on the other; and on the Italian front to the south. Imagine living in a war zone where every day you wondered whether you and your children would still be alive tomorrow. Imagine not knowing how you were going to put food on the table for your family because there just was none available and the possibility of starvation haunted you daily. Imagine waiting for news of your loved ones at the front lines or in the next town and finding out that a father, husband, or brother had been killed in battle or died of illness. Imagine being driven from your home because the fighting was getting too close and then coming back to your village to find your house destroyed, your worldly possessions gone. Imagine the life you knew being torn away from you overnight and having to fight daily for your life and the life of your family. However, women did find a way and managed to survive and help their families survive. They found the strength to persevere. They never gave up and used their motherly instincts to protect their families, to scavenge for food and to find safe havens for a night or two. These women are heroes that should never be forgotten and should be an inspiration to all women every day of our lives. My maternal grandmother, Helena, was living in Russian controlled Poland during the outbreak of WWI and my paternal grandmother, Maria, was living in German controlled Poland in the west. They both lived through WWI and were raising their growing families in Poland when WWII broke out. Although both were living at opposite ends of the county, one in the east and one in the west, both were deported to Russian labor camps in Siberia during the course of the war and neither ever returned to their motherland. They were both strong and amazing woman who went on to live into their 80s – one in Scotland and one in Canada – and I was one of the lucky women that got to know and to learn from both of her sage grandmothers. World War I, known as The Great War, was supposed to be the war to end all wars. This entry was posted in Inspirational, Mother, Wife, Women and tagged Australia in WW1, Britain in WW1, Canada, Canada in WW1, First World War, Grandmother, herstory, inspiration, Inspired by my mom, inspiring story, Mother, nursing in wartime, Poland, Remembering the Great War, The Great War, wartime, Woman, Woman in wars, World War 1, WWI. Bookmark the permalink.